UNLIMITED TACO SAMPLES FROM OVER 35 VENDORS IN DALLAS AND BEYOND! Dallas’ largest taco festival is back and better than ever! Join us for the 4th Annual Tacolandia! This outdoor taco-sampling festival will feature over 30 of Dallas’ best taquerias, from urban contemporary to authentic street-style. It will also include music, cash bars with beer, wine and cocktails as well as awards for best tacos in various categories. Get your fill of tacos, one of Dallas’ most iconic foods, only at Tacolandia! 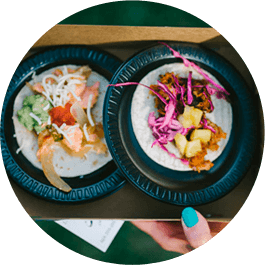 Over 30 taco vendors will be onsite sampling the tacos that have been making their restaurants the best for generations! You cannot miss Dallas’ largest taco festival. A full list of participating restaurants coming soon! Additional entertainment will include a DJ as well as other live performers! Grab your tickets today! General Admission tickets start at $25 and include entry into the event at 4pm, unlimited taco samples, music, and cash bar. VIP tickets start at $65 and include all of the general admission benefits PLUS early entry into the event at 3pm, access to VIP lounge with exclusive VIP only taco samples, specialty cocktails, as well as VIP restrooms. Please note that this is a 21+ event and you will need to show government-issued ID for entry into the event at Dallas Farmers Market. *Ticket prices are subject to increase so buy early! !